It’s pretty impressive how we can now share photos with our friends instantaneously. I still remember the slow dial-up internet days and now we live in a generation where it’s odd when a photo takes more than 2 seconds to load. Instagram continues to revolutionize the social media realm with its photo and video sharing capabilities. But most recently, the implementation of the Instagram story is the platform’s biggest hit. With Instagram stories, you can now update your followers on what you’re doing at any given moment. You can post Instagram stories in the form of a short video or a vertical photo, which disappears in 24 hours. You can keep track of who views your Instagram stories and you can even add your story as an IG story highlight to your Instagram profile. We’ve dug deep and analyzed the art of the Instagram story. Here are some of the best practices and the proper Instagram story size so you can go out and create professional and compelling IG stories to share. Bonus: Create Instagram stories in less than 60 seconds with our free instagram story templates! 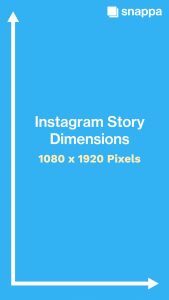 The Instagram story dimensions are 1080px by 1920px, which is an aspect ratio of 9:16. What this means is that your IG story video or photo will have to be 1080 pixels wide by 1920 pixels in height. Instagram is very strict about the size of your Instagram stories. If you upload a photo or video to your Instagram story that doesn’t fit the required dimensions, Instagram will crop and sometimes zoom into your photo / video. This will cause for a loss in quality and sometimes important visuals being cropped off. How Can I Create an Instagram Story? If you’re looking to add a simple photo or video to your story, all you have to do is film your video or take your photo with your camera vertical. Yes… that’s right… the opposite of how videos are typically filmed. If you’re looking to create professional Instagram stories that have nice text and better visuals, there are a few more steps you should consider. 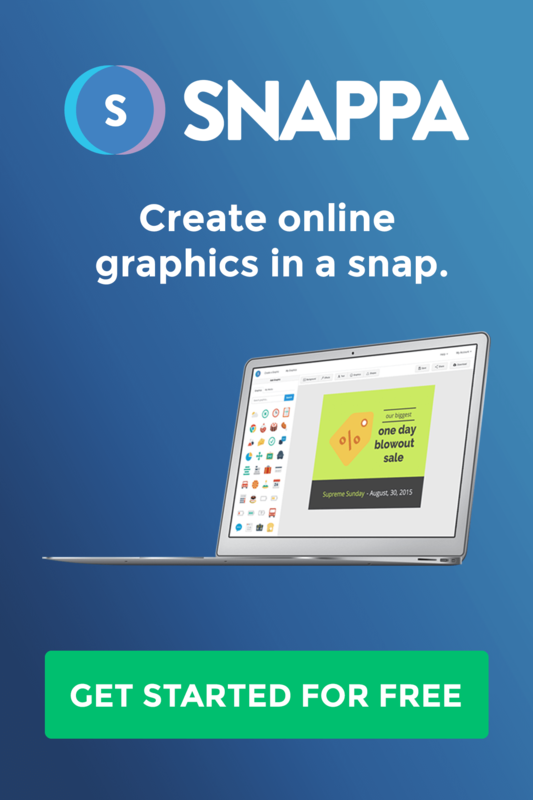 You can use an application like Snappa to create Instagram stories for yourself or for your business. 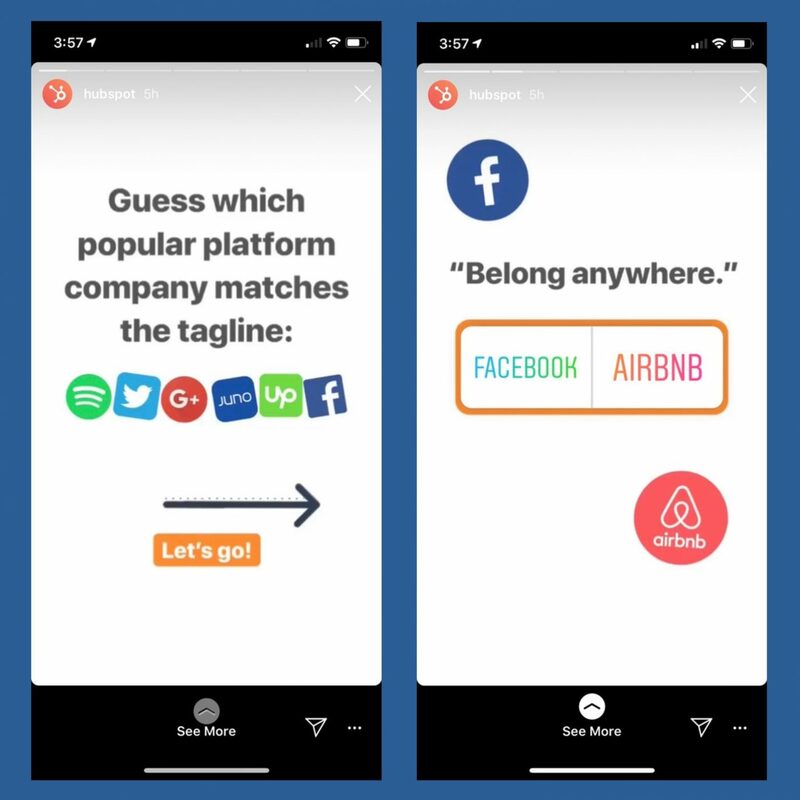 Snappa has several Instagram story templates that you can use to customize to your brand’s needs. Here is a video that demonstrates how you can create an Instagram story design within less than 2 minutes. Additionally you can take a video that you’ve taken off of your camera that was shot vertical and crop it using programs such as iMovie, Adobe Premiere Pro, or Final Cut. Any of these video editing programs will allow you to crop your video to 1080 x 1920 which would fit the proper Instagram story video dimensions. What Are Some Instagram Story Ideas? Instagram stories are great because of how versatile they are. You can use IG stories to to sell a product, promote your brand (personal or corporate), or even use them as a medium to keep your followers up-to-date. Many users ask “how can you add a link to an Instagram story?” You can include a link to your Instagram story if you’re a business profile with over 10 thousand followers. With this ability you can prompt your followers to swipe up and visit a specific web page. This is essential if you have a blog post or product to promote. If you’re not a business, you can still promote your new posts. You will have to tell users to interact with your profile. Inform your users to visit the link in bio for more information and to direct them to the relevant page. How about a behind the scenes look? You can use Instagram stories to give your followers a glimpse of what’s happening in your everyday life or within your business. Teasers are a good way to build excitement for future content and products. Giving your followers a sneak peak will keep your brand on top of their minds as they anticipate the release of new content or products. The more I write about the Instagram story, the more I think about how I should be using it more myself. Instagram has added a new feature which allows you to add a poll on your stories. You can ask any question you like and with a tap on the screen, you can see what your followers answer and it tells you exactly who answered what. This is essentially free market research and if you ask the right questions, you can gain some great insight about your audience. If you’re trying to keep a certain look or style on your main Instagram feed, it probably isn’t the best idea to repost photos or videos from your customers or viewers. This is because you don’t have much control over how your customers produce these photos or Instagram videos, but testimonials are always a great source of content. Instagram stories are great way to showcase the content that your users share about your product without ruining your Instagram feed. You might even make their day by reposting their footage! Additionally, if your brand picks up any press, it is a good idea to use your Instagram stories to display this. 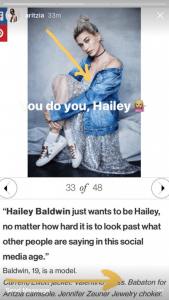 As you can see, the clothing brand, Aritzia, found out that influential Instagram influencer and celebrity, Hailey Baldwin, was wearing one of their pieces. They took this opportunity to screenshot the article and share it with their followers on their Instagram story. It is easy! But, before you start, let’s take a step back and look at some of the Instagram story mistakes you should be aware of before creating your first IG story. For Instagram stories, you are limited to 15 seconds per individual story. But… you can post however many stories you want. The key is to avoid the swipe away! The swipe away is a follower skipping through your entire story and you want to minimize this by keeping your stories short and concise. Just like Snapchat, the last thing you want to do is watch a short film when you’re viewing a story. The stories are limited to 15 seconds for a reason, so consider that when posting your content. Just like any form of social media, avoid too much promotion of your business or brand. If you’ve ever watched Gary Vaynerchuk, you would know that he is all about the jab, jab, right hook. This generally means providing some type of value before hitting your followers with a promotion or call-to-action to do something for you. Remember… you’re limited to 15 seconds per Instagram story… Enough time to read a subheading or two, but not enough time to read a J.K. Rowling trilogy, so keep it short! The last thing anyone wants to see is a wall of text on their social timelines, so once again be concise in your wording and make sure your content is attention grabbing and brings some sort of value and entertainment to the audience. A neat feature with Instagram Stories is the ability for you to use hashtags that will help users across the platform discover your content. What you want to avoid is using too many hashtags since this would look very spammy on your story, but you also want to avoid using irrelevant hashtags. Add a few story hashtags where it makes sense and make sure it creates some type of value for discovery. We’ve written a full guide on using Instagram hashtags and many of these principles apply to Instagram Stories as well. Ok now enough of the tactics, it’s time to give you some inspiration to go out there and create some great Instagram stories. Here are a few brands that have done just that. 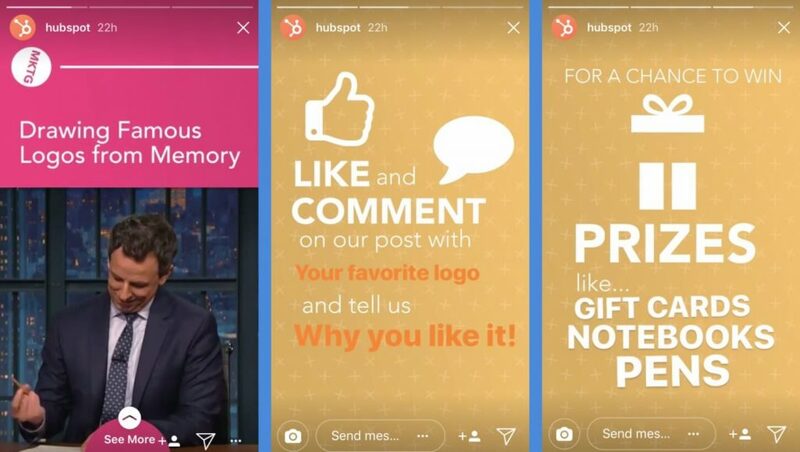 Along with their great Instagram profile picture, HubSpot is a great example of a brand using their Instagram stories as a way to create more engagement between Hubspot’s own brand and audience. For one, you have an interesting article being promoted, a call-to-action to direct user interaction, and an incentive for followers to engage. If you’re looking for a way to build your Instagram engagement, check out this detailed guide on how you can gain more followers organically. Influencer marketing seems to be all the rage right now in social media marketing. 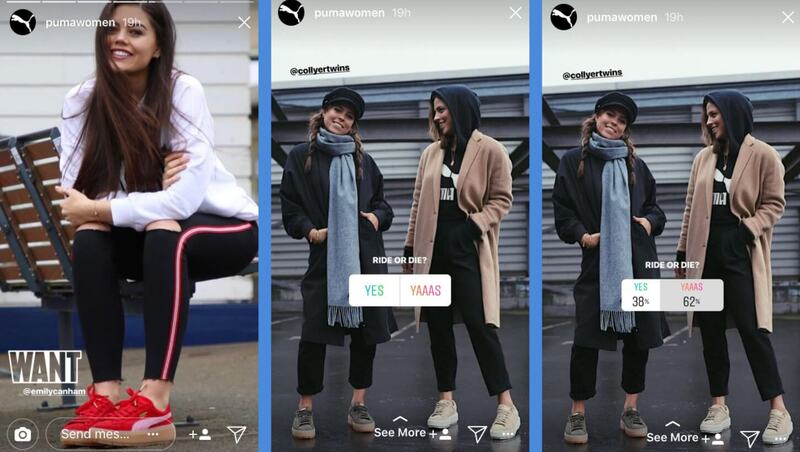 Puma Women uses influencers in their IG stories to wear their products and they do a great job incorporating the Instagram poll feature. Although they may not be getting a ton of valuable information from this poll, they are still engaging with their audience and they can see who exactly is engaging. A car show? How about a sneak peak? The Mercedes Benz team does a great job giving a behind the scenes look at their car show at the Los Angeles Convention Center. What better way to hype up a crowd of car enthusiasts with some high-quality footage of what they can expect to see. 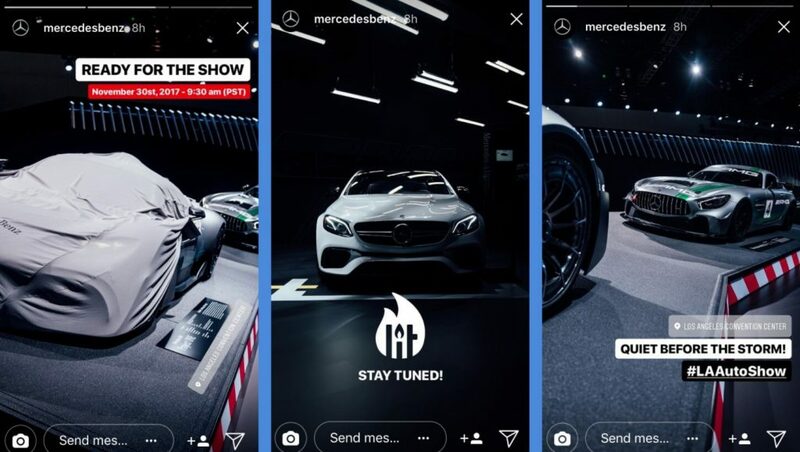 Seeing a car through a photo is one thing, but seeing a car in person is a totally different experience and Mercedes did a good job attracting visitors with these stories. Additionally, the Mercedes Benz AMG team does a great job showing off their AMG class series to their followers. 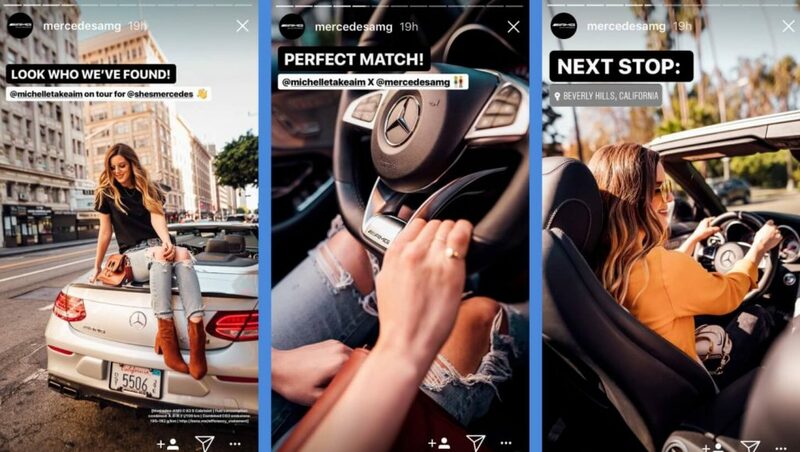 Here we see the use of influencer marketing with Instagrammer @michelletakeaim to promote the She’s Mercedes campaign. You get to see a slice-of-life approach with Michelle enjoying the car in Beverly Hills. Although these stories are a clear ad for the car brand, they have created compelling content and have clearly shown the ideal lifestyle of a targeted female consumer that would want to be in Michelle’s shoes. Should you stop posting regularly on Instagram and just post Instagram stories? No. The Instagram stories are an additional feature that can help you gain a more engaged following. 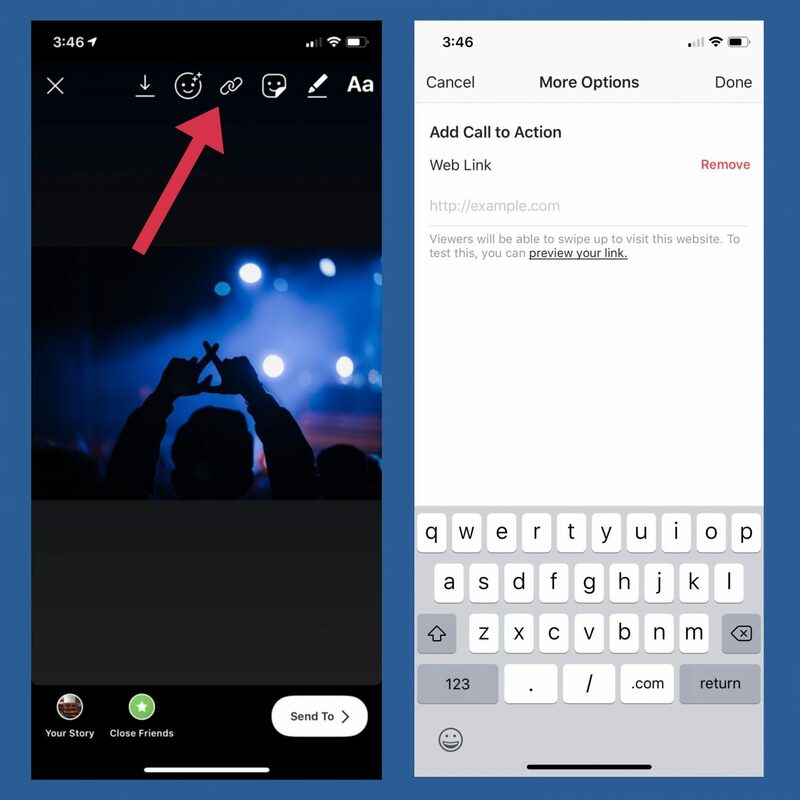 It is a medium which you can use to add call-to-actions by adding links to your IG stories and direct your followers to a certain place. It can even be used to simply create more brand awareness. Creating an Instagram story doesn’t take much, but creating an engaging story can take a bit more effort. Remember to not overwhelm your followers and to incorporate strong visuals and graphics to really help your brand stand out from all of the other brands. Remember to use the proper Instagram story dimensions of 1080 x 1920 so that you can achieve the best quality IG stories. This will ensure that Instagram doesn’t crop and ruin your visuals. Be creative, be unique, be personable, and you will have a great amount of success using Instagram stories! Have any tips and tricks for creating Instagram stories? What are some brands that have created Instagram stories that you like? Let us know down in the comment section below! Use our marketing-ready templates to create your next Instagram Story. Load the perfect dimensions in one-click, and ditch the clunky graphic design software for good.